Critical literacy in the news is important to be able to spot biased, fabricated or misleading news. Can you spot biases, fabrications and misleading information in the news? We are being bombarded with opinions, false and misleading news on a regular basis. Hence, t is extremely important to be able to discern the differences between facts, opinions, fake and misleading news. Show your media smarts by being a news skeptic, know when to reject or accept the news you read. ❶ Looking at the headline, what does your inner voice say? Does it seem believable? Outrageous? Does something signal a ?red flag? to you? What is your initial reaction? Biased? Fabricated? Misleading? How do you know? ❷ Has the story happened or is it set in the future? Any story that says what will happen isn?t really first hand info. ❸ Does the story have a credible source and writer/author? How do you know? ❹ Is there a bias? If so, what is it and how do you know? ❺ Is it misleading? If so, how do you know? ❻ Is this news completely fabricated? How do you know? ❼ Is this news ?sponsored content?. How do you know? 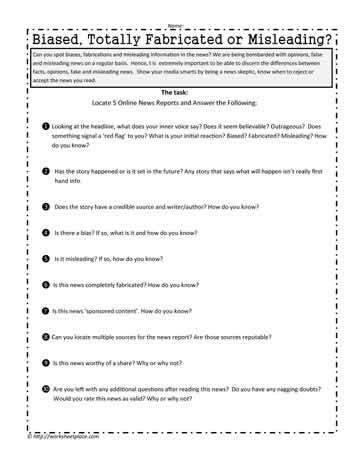 ❽ Can you locate multiple sources for the news report? Are those sources reputable? ❾ Is this news worthy of a share? Why or why not? ❿ Are you left with any additional questions after reading this news? Do you have any nagging doubts? Would you rate this news as valid? Why or why not?